As part of a project funded via the NSF Geoscience and Education, we worked with Jason Cervenec (BPCRC outreach coordinator) and Steven Gordon (Ohio Supercomputer Center), and with Howard Greene (College of Engineering Diversity & Outreach), to help develop a simple curriculum for doing hydrology in high school and middle school. It has some nice hands-on components (e.g. measuring infiltration in a soup can you leave under a sprinkler), tools and ideas for exploring small watersheds, and a simple web-based hydrologic model. The hydrologic model (based on NRCS curve number for runoff, channel slope for time of concentration, and NRCS unit hydrograph for routing) is really just a few lines of code, but allows high school and middle school students to get a feel for how changing land cover might affect streamflow. The module consists of five units, and are all available for download here. The web-based model is hosted here: both are at BPCRC. 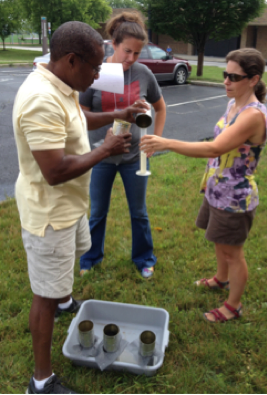 Teachers measure how much water has infiltrated through various types of soil in soup cans. 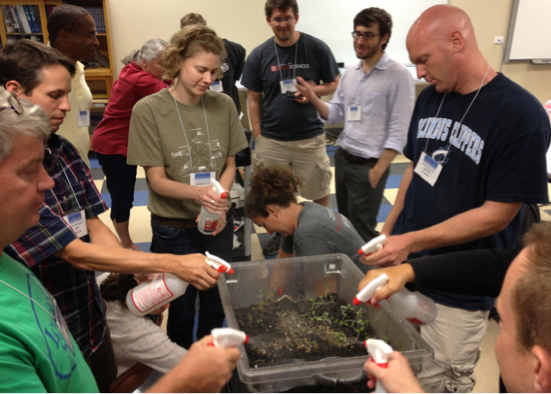 Teachers at workshop measure simulate precipitation over a “terrarium watershed”, and measure watershed outflow or runoff.